What do I do now? 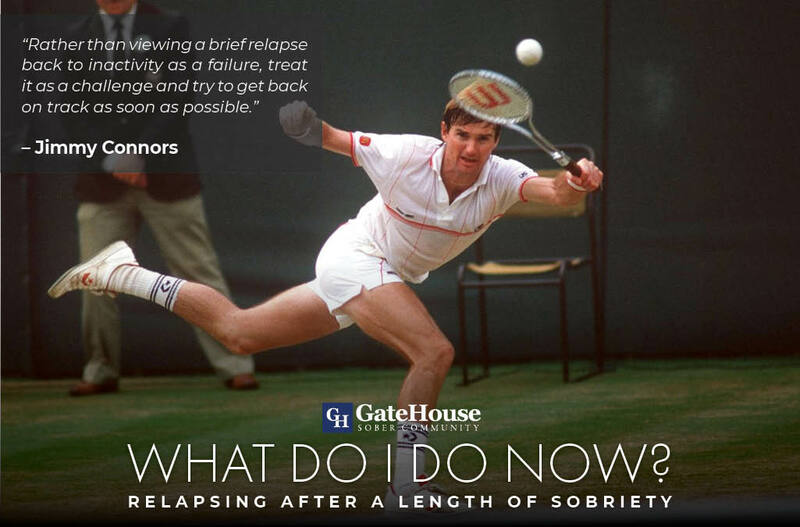 Relapsing After a Length of Sobriety | GateHouse Sober Community What Do I Do Now? Relapsing After Having A Lengthy Period Of Sobriety. I have been sober since 2005, minus ten weeks. At eleven and a half years sober I went back into active addiction. I had been a dry drunk who put down the tools of the program for over a year. There were no meetings, no sponsor, sponsees, prayer, meditation, inventory or helping others in my life at that point. I had slowly phased all those out. My daily routine consisted of ten hours of sleep, fourteen hours of television all interrupted by fast food or delivery of food. I locked myself in my house for almost a year. I wound up 303 lbs., ashamed of myself, scared to leave my house. Before that, I had been a reasonably fit, well known and respected member of the recovery community best known for speaking at meetings. I saw no way out of my pain but suicide or using drugs. I’ve never felt more alone. February 2017 I chose the pipe over the pistol and through Divine intervention was brought back into recovery on April, 16th 2017: Easter. My life had been resurrected, but the work was just beginning. What was I to do? The path of those who had time and lost is not the same as the first timer in some ways. I’m discounting those who had only dry time and never worked the steps in the first place. Some people get years in AA without doing AA. Whether they are miserable on the inside, non-alcoholics in AA, or anomalies I can’t speak to that. I have no personal experience with it. There are consistent themes with the true relapses. The people who have worked the steps with a sponsor had a spiritual experience and worked with others. They’ve attempted to practice those principles in all their affairs have done the process and then undone the process. In essence, they have worked themselves backward through the steps. All the way back to one and became powerless again. There are two answers on how to get back up and stay up. What worked before will work again. Getting through the steps will be the obvious answer, although possibly an oversimplification. The process calls for complete thoroughness and honesty. Many missed spots are things like secrets held back in a 5th step. Unmade amends, not working with others as a sponsor and being undisciplined with the daily practices of working a program. If these were the issue, fill in the gaps this time. Half measures never work long term. We don’t have to do it all perfectly, but we do have to do it all. If all of the basics stated above were applied and a person still wound up drinking or using, we can only logically assume one of two things. Either the steps don’t work, or they were not applied to other avenues of life. Many doing the deal who are active in recovery and service still go out. I found this confusing for many years. These are most often “Spiritual Bypass” issues. “Spiritual bypass is a defense mechanism. Although the defense looks a lot prettier than other defenses, it serves the same purpose. Spiritual bypass shields us from the truth, it disconnects us from our feelings and helps us avoid the big picture. It is more about checking out than checking in—and the difference is so subtle that we usually don’t even know we are doing it.” The article “Beware Spiritual Bypass” in Psychology Today explains how this occurrence can cause our spiritual practices to become a hostage to our ego distracting us from the next level of growth. How Does Spiritual Bypassing Relate to a Relapse After a Length of Sobriety? A recovery example of this would be an AA member doing his best to show up in life. He is sponsoring many people and also has a girlfriend. He is wrestling with abandonment issues and insecurities causing spiritual unrest in his life and relationship. Spiritual bypassing would be looking to help more people to increase how “spiritually fit” he is, or “out of his problems.” When in all actuality it would be more appropriate to get therapy or some form of help on core issues. No amount of sponsees will help him overcome that. Physical and emotional fidelity are addressed by service to others. I’m speaking from personal experience. Most of the issues missed by spiritual bypassers will show in the areas of problems with either romance of finance. Any issues that aren’t addressed through working the steps to deal with the drinking and using issue will present themselves again. Life seems to show the same lesson over and over until its learned. It will continue to manifest itself until we work through them or die as a direct result of this disease. Relapse isn’t a death sentence. If they make their way back alive, there is still hope. Willingness comes a long way and can save a life. If you are seeking treatment after having a relapse, or are just coming back from having long term sobriety, we can help. Call us today at , we have admissions personnel available 24 hours a day. We can help you get back on the road to recovery.